It can be used in routes that change directions. ost time consuming installation to construct. )The slowest installation for climbers to negotiate. BBHisher chance of injury due to increased fall factor. TRANSITION: Now that we discussed the different types of cliff assault ropes, are there any questions? Let's now discuss the construction of the cliff assault ropes. 3| (15 Min) CONSTRUCTION OF CLIFF ASSAULT ROPES. The difficulty of the terrain will determine what type of rope installation will be utilized. 9 Simple Fixed Rope. This is the quickest and easiest of the installations. There are two methods to establish this installation. ¡Coiled Rope Method. )A climbing team will assemble at the bottom of their assigned climbing lane. |The lead climber will begin climbing up the obstacle with a coiled static rope on his body. The #2 climber will provide security. |The number #2 will back stack a static rope while the lead climber visually inspects designated route and provide security. The #2 climber ascends the route and ensures the rope is on the correct route. H^The #2 will anchor and tighten the bottom of the rope before climbing up. 9 Fixed Rope. This installation is more time consuming to establish because of the intermediate anchor points but it provides extra protection against falls. ^The assault climber picks a route and the climbing team sets up for a two party climb. efore the lead climber begins to climb he will flake out a static rope and tie one end of the static rope into the back of his harness with a figure of eight loop. ^The lead climber begins two party climbing, placing protection where needed. He will also ensure that he clips the static rope into each piece of protection along with the climbing rope. ¡^^The climbers should not be forced to cross the rope at any point once it is tightened. ^Natural anchor points can also be used as intermediate anchor points. ^Once on top, the lead climber will remove the static rope from his harness and anchor it off using an appropriate anchor knot. The lead climber will either tie himself off or move further than 10 feet away from the cliff face. The lead climber is now off climb and will give the appropriate signal to the #2 climber. flWhen the #2 climber gets the "off climb" signal from his partner, he will break down the belay stance and untie from the dynamic climbing rope. |At this point the lead climber will pull up the dynamic rope and coil it. Once the rope is coiled the lead climber will go report to the senior assault climber for follow on mission. 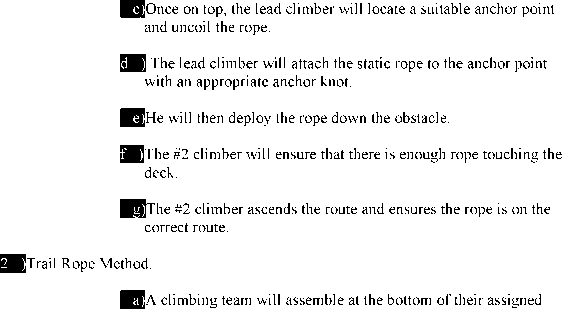 )The #2 climber will find the end of the static rope and tie a figure of eight knot in it. The rope will then be attached to the first piece of pro not more than waist high. gWith a Type II cordage, the #2 climber will tie an end of the line prusik knot onto the static rope. The running end of the cordage will be attached to his hard point utilizing a locking carabiner. fl^^The #2 climber will begin to climb the route, sliding his prusik up the rope as he climbs to protect himself in case of a fall. fl^^The static rope will be secured to each piece of protection, also referred to as intermediate anchor points. The #2 should remove any runners the lead climber placed unless needed to direct the rope. This is accomplished by tying the static rope to the piece of protection's carabiner using the slip figure eight, clove hitch, or figure of eight loop knot. 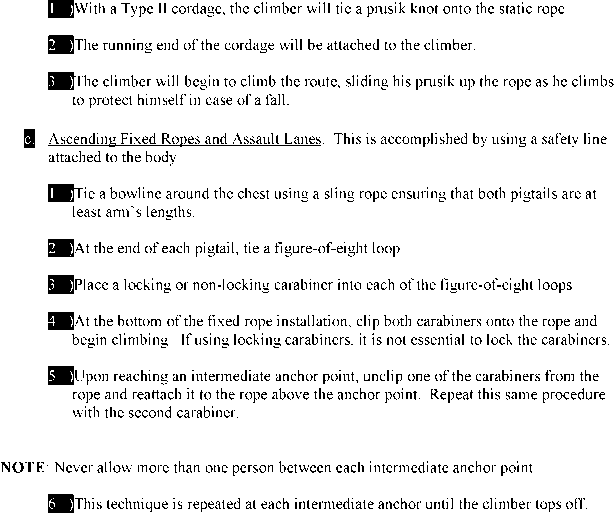 NOTE: By anchoring the rope at the intermediate anchor points, each section of rope is made independent of the others. Should one section fail, the other sections remain intact. All intermediate anchor point failures should be reported immediately to the installing unit and fixed promptly. The #2 will ensure that there is no slack between each intermediate anchor point. When the #2 climber reaches the top, all slack should be taken out at the top anchor point and reattached, ensuring that the static rope is as tight as possible. NOTE: If the route is more then one pitch, the same procedures will be followed as mentioned above with the incorporation of a multi-pitch climb. The #2 climber will be responsible for trailing an additional static rope. When he reaches the lead climber's belay stance, their roles switch. It is the responsibility of the climber in the belay stance to adjoin the two static ropes together. The intermediate anchors are not tied into the static rope. ^^The rope can be tensioned at either the top or the bottom, preferably from the bottom. TRANSITION: Now that we have discussed the different types of assault ropes, let us talk about how to ascend them. 4| (10 Min) ASCENDING CLIFF ASSAULT ROPES. Each rope installation requires different techniques for ascending. Proper commands or signals should be disseminated within a unit before ascending assault ropes. Gloves will not be worn during the ascent because this may give off a false sense of grip on the rope. I! Ascending Simple Fixed Ropes. This is accomplished using the Hand-over-Hand Method. Straddle the rope with your legs. )Grip the rope palms down, thumbs toward your body. )Walk up the slope pulling with your arms while twisting the hands inward. This will create a bind between your grip and the rope. b Ascending Semi-Fixed Ropes. This is accomplished using the Safety Prusik Method. TRANSITION: Are there any questions on how to ascend an assault rope? Once the rope is up, it must be maintained to prevent a catastrophic failure of the system. 5! (5 Min) MAINTENANCE OF A FIXED ROPE. There are two criteria in the maintenance of fixed ropes. a All assault rope installations should be buffed at points of abrasion. 3 All assault rope installation anchors should be inspected periodically for accidental dislodging, walking of cams or improper direction of pull. d All discrepancies should be reported immediately to the assault climbers for repair. TRANSITION: Are there any questions over the maintenance of fixed ropes? Let us now talk about clearing the route. 6| (15 Min) CLEARING THE ROUTE. Once all the climbers have ascended the cliff it is necessary to dismantle the fixed rope to retrieve all the equipment and rope. Various methods may be used to dismantle the fixed rope depending on whether clearing the route from the top or the bottom. a Rappel Method. This method is used when clearing the route from the top. )If the climber needs to ascend the cliff, he may be top roped up by his climbing partner. b Safety Prusik Method. This method can be used when clearing the route from the bottom or the top. 0The climbing team establishes a rappel line using the climbing rope. ¡^^The climber will descend to the bottom of the obstacle using the first man down technique. jThe climber will ascend the rope by sliding the safety prusik up as he climbs to protect himself in case of a fall. ¡The climber must create some slack in the lane by adjusting the top anchor point. ^^The climber will descend the fixed rope lane using the first man down technique. BBwhen he reaches an intermediate anchor point he will hang on the prusik and untie the fixed rope from the protection. ^JQThe climber will remove the protection and stow it away. «flThe climber will continue to clear the entire lane in this manner. 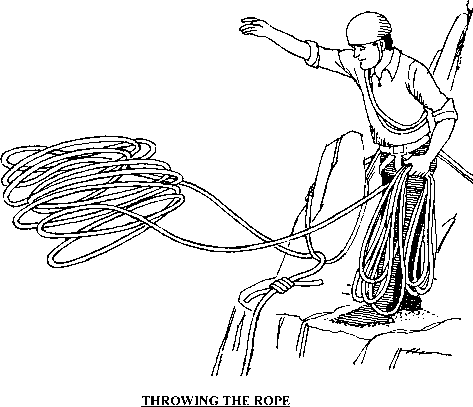 BQ If the climber needs to ascend the cliff, he may be top roped up using the static rope he just unfixed. 9 Top Rope Method. This method is used when clearing the route from the bottom. ^^The climbing team establishes a top rope. ^^The one climber clears the route while the other climber belays him. TRANSITION: Are there any questions over clearing the route? If not, let us discuss cable ladders. (15 Min) CABLE LADDERS. The cable ladder is constructed with stainless steel cables and aluminum crossbars, which are also known as rungs. Each cable end has a steel ring (eyelet) large enough to accommodate the largest carabiner in the MAC Kit. These rings allow cable ladders to be connected to each other. The cable ladder is also referred to as a caving ladder. ^^There must be sound anchor points located at the top and bottom of the ladder. ^®You must be able to anchor the ladder along the route to keep it from swaying. There must be suitable loading and unloading platforms. ^^Cable ladders provide excellent protection in rock books, chimneys and overhangs. NOTE: Cable ladders should be set up starting from the top anchor. b Ladder Installation Using Natural Anchors. Ensure that there are two sound anchor points located at each end of the ladder. )With one end of a sling rope (or 1" tubular nylon tape), tie an appropriate anchor knot around a sound anchor point. )With the other end of the sling rope tie a round turn and two half hitches onto a carabiner attached to the eyelet of the ladder. This knot is utilized since it is easy to adjust. o the same to the opposite eyelet, pulling tightly enough so that there is no slack between the eyelets and the anchor points. eploy the cable ladder down the obstacle. )Tying a figure of eight loop at one end of the sling rope and clipping a locking carabiner into the loop. i^^Attach the locking carabiner to the ladder by placing it around the cable and above a rung. )If intermediate anchors are needed on the route of the ladder, make sure each side of the ladder has equal tension. The ladder can be tightened from top or bottom, if needed. Use an appropriate anchor knot at the anchor, then tie a round turn (or slip 8) on the carabiner, tighten, and tie off with 2 half hitches. 9 Ladder Installation Using Artificial Anchors. )Locate the middle of a sling rope (or a 1" tubular nylon tape) and tie a figure of eight loop and clip a carabiner through the loop. Attach the carabiner to the ladder's eyelet. )Secure each sling rope's pigtail to its own piece of protection with a round turn and two half hitches. This knot is utilized since it is easy to adjust. )Do the same to the opposite eyelet, pulling tightly enough so that there is no slack between the eyelets and the anchor points. )Deploy the cable ladder down the obstacle. )The bottom of the cable ladder can be secured in the same manner as the top. If the ladder is longer then the obstacle, it can be secured in the same method as discussed earlier. The ladder can be tightened, if needed, as discussed above. NOTE: The ladder can be tightened from either the top or the bottom so it can remain as rigid as possible. TRANSITION: Are there any questions about the installation of cable ladders? If not, let us discuss ascending the cable ladders. 3! Climb as any other type of ladder. g Climb with one arm and one leg on each side of the ladder. Ensure that the outside foot is placed in the rung toe first while the inside boot is placed in heel first. c. Concentrate on using your leg muscles more then your arms. d When climbing up a steep slope, climb hand over hand with the legs straddling the ladder, walking up the slope. This is similar to climbing a simple fixed rope. the ladder, the climber can use a safety prusik to ascend the cable the ladder, the climber can use a safety prusik to ascend the cable ladder. NOTE: The top anchor point for the method of protecting the climber will be separate from that of the top anchor point for the ladder. TRANSITION: Now that we have discussed cable ladders, are there any questions? These are the techniques used to conduct cliff assaults. The actual conduct will be discussed in another class. If you have no questions for me, then I have some for you. Q What are the three types of fixed ropes? A (1) Simple Fixed Rope. Q| What types of knots can be used at intermediate anchor points of a fixed rope installation? B How does the climber tie into a fixed rope installation? A With a round the chest bowline with a figure of eight loop at each end of the pigtail. A carabiner will be clipped into each loop. This is known as a safety line. a During this class we have covered simple fixed rope, semi-fixed, fixed rope and the cable ladder installations. ¡9 Those of you with IRF's please fill them out at this time and turn them in to the instructor. We will now take a short break.